After a hectic weekend in San Francisco all I wanted was a simple, healthy meal. This is a perfect recipe you can still make even when life feels too chaotic to cook. It calls for a minimal number of ingredients and will take you less than 20 minutes to prepare but still yield the comforting flavors I crave. Hope you enjoy it too! Combine soy sauce, oyster sauce, water and cornstarch into a separate bowl and set aside. Cook noodles and toss with 2-3 tablespoons of shallot oil to add flavor and keep them from sticking together. Set aside. Heat 1-2 tablespoons of oil into a large wok, cast iron, or non-stick pan on high heat. Once heated, add in sliced steak and toss quickly. 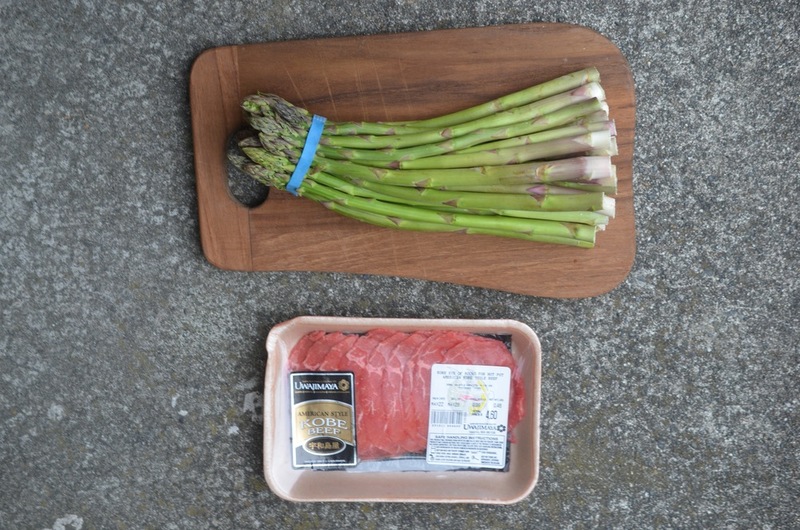 Once steak begins to brown (about one minute), add in asparagus. Stir fry beef and asparagus together for 2-3 minutes. Add in soy sauce-oyster mixture and bring down heat to medium. Stir ingredients until sauce turns clear and thickens. Pour over cooked egg noodles and serve immediately.